A representative sample of the early period of Neoclassicism in Greece, the building is an abstemious work of strict geometry in its mass. The formation of its spaces forms a frame and a central rectangular body that separates the opening in between in two courtyards. Doric-style column rows stand in front of the facade and the back (eastern) side. It was built between 1836 and 1840 based on the study of the Bavarian architect Fr. Goertner. Originally it served as a palace of Otho, the first King of Greece after the end of the Turkish occupation, who moved from Nauplion (initial royal seat and temporary capital of the Hellenic State) to Athens in 1834. The expenses of its construction were carried out by Otho's father, King Ludwig of Bavaria, who financed the project as a personal loan to his son. The Greek state expropriated the estates occupied by the building, the front plaza and the royal garden. The first Parliament was temporarily housed in a private residence building in Kolokotronis Street while afterwards it moved to the University building and much later, in 1857, to the building of Stadiou Street that houses today the Museum of History and Ethnography. In 1884 and 1909 the building suffered damages in fire and in 1910 was abandoned by the royal family. 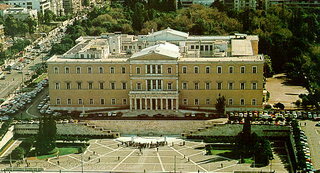 It was then remodeled to house the Hellenic Parliament in 1930, by the architect A. Kriezis and finally in 1935 the National Assembly moved in. 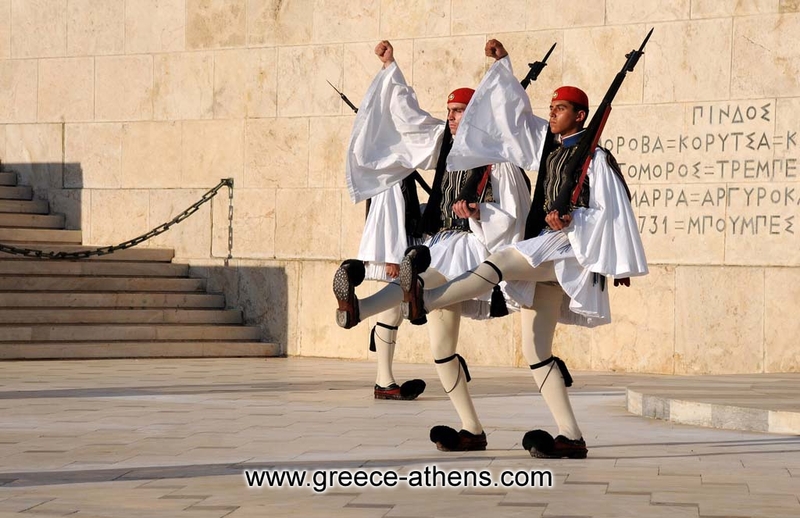 Today, it serves still as the seat of the Hellenic Parliament and houses offices, the National Assembly Room, the office of the president of the Assembly, the Archives and other services. By a ministerial decree of 1952, the building was identified as "in need of special protection" according to the relevant 1950 Law.